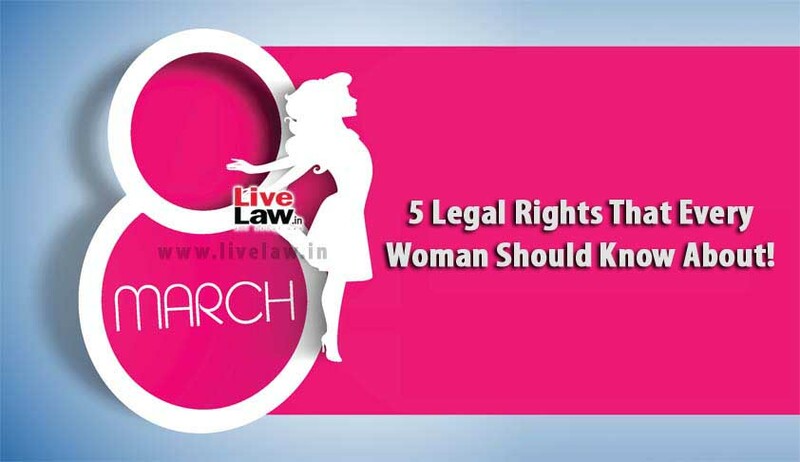 5 Legal Rights That Every Woman Should Know About! We hear people saying that India is not a safe place anymore and that offences and crimes against women has been rising rapidly. Where goddesses are worshipped while women (of any age) are raped, grouped and harassed. The only way out to keep an eye on such horrific happenings is to make laws and rules stricter to keep a check on such shaming crimes, but also on the other hand these laws are also misused to cater evil motives. Most people are unaware of their legal rights until they appoint a legal firm/advocate for their problems. Merely a handful of them would nod and say, 'Yes, I know my legal rights' and this handful people are from the genre of literate people. We should endeavor to enlighten people on their general legal rights so that they are apprised that they are not misguided by the authorities. The article aims at creating awareness among women, from all walks of life, about some of the major rights that they are entitled to so that they don’t become the prey of the social evils of the society. Right against sexual harassment: As per the Sexual Harassment Act 2013, it is now mandatory for every organization consisting of more than 10 employees to form an Internal Complaint Committee (ICC, is constituted under section 4 of Sexual Harassment Act 2013), wherein the complaints of Sexual Harassment can be filed, inquired and processed, for granting relief to the woman aggrieved. The sexual harassment act provides protection to women against sexual harassment at workplace and for the prevention and redressal of complaints of sexual harassment and for matters connected therewith. If any organization is found being non compliant with the provisions of act shall be punishable with a fine of Rs. 50,000 which shall extend up to 1 lack rupees and can even uphold cancellation of license of the organization, if found guilty for the same offence previously. 4 Right to inherent property (Hindu succession act): According to section 6 of Hindu Succession (Amendment) Act, 2005, the daughter also has a right in the property of her parents as the sons have, unless there is a will by the parents which does not entitle her to the same and the property inherited is acquired by the parents on their own. The share of daughter and the son is same and she also has a right to shelter in her parents house if she is deserted or divorced by her husband or is widowed. However, this statement varies from case to case whether the property is inherited or self-owned, lien over property, whether its joint family or not, etc. The basic rule which we want to convey is that women have the same and equal right, as their brothers have, in their parents’ property. Advocate Kanishk Agarwal is a Founder of CriTaxCorp and IBAP.